This strategy aids us in constructing a portfolio that suits the needs of our client. Our Investment Team uses a long-term time horizon to select investments, and to determine the relative attractiveness of each asset class and the different sectors within those classes. In addition to fundamental and macroeconomic research, Inverness utilizes strategic analysis to assist in the allocation process. 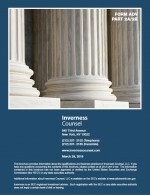 Inverness' equity selection is fundamentally based, taking into account each client's specific investment policy. Our Team begins with quantitative modeling to reduce the investment universe to a manageable subset, then vets and narrows potential investment ideas. Additionally, the Investment Policy Committee will conduct in-depth analyses and monitoring of specific security yield recommendations. From there, our Investment Managers craft each client's portfolio to the diversification and risk levels as dictated by the client's investment policy. As detailed in the client’s investment policy, portfolios are customized to account for portfolio duration, security concentration, and rating agency quality. The mix may include: governments, municipals, agencies, preferred stocks, corporates, mortgages, and asset-backed securities. All client cash is held in money market funds, with the particular fund / instrument determined by The Firm within the boundaries of custodial offerings. Cash equivalent investments (treasury bills, commercial paper), are utilized to increase returns within specific risk and return parameters. The Inverness objective is for every investment dollar to be working and adding value, while also taking into account future maturities for clients' potential need for funds.